I have accepted a challenge to be candidate for Mrs. Villasis 2010 - to raise awareness and funds for the renovation and further improvements of our public auditorium in particular and for the benefit of the townspeople of our beloved Villasis in general. My name is REYNALDA LAGLEVA–RAMOS. I was born on August 20, 1953 — the 3rd of 10 siblings of the late Fortunato Lagleva of Agoo, La Union and Benedicta Andaya of Caramutan, Villasis, Pangasinan. I am married to a fine gentleman from Dagupan City, Mr. Alex V. Ramos, and we were blessed with three loving children: Michelle - 32 years old; Paul Alexander - 30 years of age and John Alexander - 25 years old. Likewise we have been blessed with 3 wonderful grandchildren. Two from Michelle & Mel Reyes, namely: Maya Riona and Marcus Riley and one from Paul and Kae Ramos - named Rylan Alexander. Our youngest son, John Alexander, graduated e-business Enterprise Management and is currently finishing a 2nd degree in Mechanical Engineering. The noble intentions of this popularity pageant and all the on-going projects initiated by our very own and indefatigable Mayor Nonato Abrenica is deserving of commendations and support. Hence, I took up the Mrs. Villasis 2010 challenge, with the full backing of the Annak Ti Villasis of Canada under the leadership of Mrs.Cristy PeBenito and Ms Josefina Organo with the cooperation of all the officers and members of the Association. Also, words of support from our “ka-ilians” in the United States and other parts of the globe have reinforced my accepting the challenge for a good cause. At this point, I would like to ask for your financial and/or advertisement support. Be assured that your financial support, however big or small, will be fully accounted for and properly acknowledged. 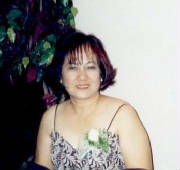 Please make checks payable to Reynalda Lagleva-Ramos and mail to: 425 East 24th Street, Hamilton, Ontario, Canada L8V 4X3 in North America or in the Philippines at 197 Caranglaan District, Dagupan City, Philippines 2400. I would greatly appreciate receiving your financial and/or advertisement support by December 04, 2009, to have enough lead time for the last canvassing on December 28, 2009. The blessings of the Lord be always with you all! Please click here to send Reynalda an e-mail message.